Shortlisted for the 2010 Le Cordon Bleu World Food Media Awards. 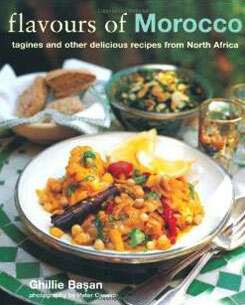 This collection of authentic recipes has been beautifully photographed on location in Morocco. KEMIA & SALADS include simple recipes such as Garlicky Broad Bean Dip, and Preserved Lemon and Tomato Salad with Capers. Explore SOUPS, BREADS & SAVOURY PASTRIES, from Creamy Pumpkin Soup with Aniseed and Saffron to Spiced Festive Bread. TAGINES, K’DRAS & COUSCOUS features the classic Lamb Tagine with Almonds, Prunes and Apricots. GRILLS, PANFRIES & ROASTS include a Baked Trout Stuffed with Dates; SIDE DISHES & PRESERVES includes Spicy Potato Omelette, whilst SWEET SNACKS, PUDDINGS & DRINKS includes treats such as Rose-flavoured Milk Pudding and Fluffy Pistachio Nougat. Also included are essays on The Souks, Spices and Sensual Flavours; Berber Traditions and Tagines; Mint Tea Culture and much more.